Used on coated papers and high low surface energy HSE and LSE plastics. Overnight or express envelopes. Features an end-of-roll indicator tab for automated dispensing. Jaco Aerospace and Industrial is your one stop resource for 2.0 mil, general purpose, extended liner, pressure sensitive acrylic adhesive transfer tape ATT with a densified kraft paper liner. 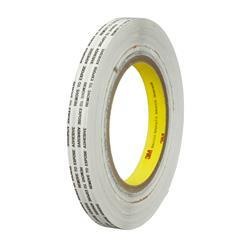 Medium Firm Acrylic Adhesive 340 family and all of your 3M Products, Tapes, aerospace and industrial needs.